Most power roller and gravity conveyors have options for roller setting, low or high. Both methods are good for different types of goals and loads. Rollers set high: If you set your rollers high in the frame, the rollers are set above the frame. This means that you can convey loads wider than the conveyor and allow them to hang over the edges of your roller. You must be sure that these loads will not collide with anything near the conveyor, that the load is stable and that it will track correctly. Rollers set low: In this scenario, your rollers are mounted lower in the frame. This lets your frame act as a short guardrail that helps packages stay on the rollers. Easier, faster installation: This reduces the overall cost of your conveyor system. Also, in this situation you may not need to mount an accumulation kit. Guard rail savings: As mentioned above you may not need a guard rail (if 2” height is sufficient). More guard rail savings: If rail taller than 2″ is required, then setting the rollers low makes installation easier and less expensive. Improved sensing of thin cartons: When set low, the system is less likely to read over or under cartons. Also, a new design using a flow tab makes it much easier to set rollers low in power systems. 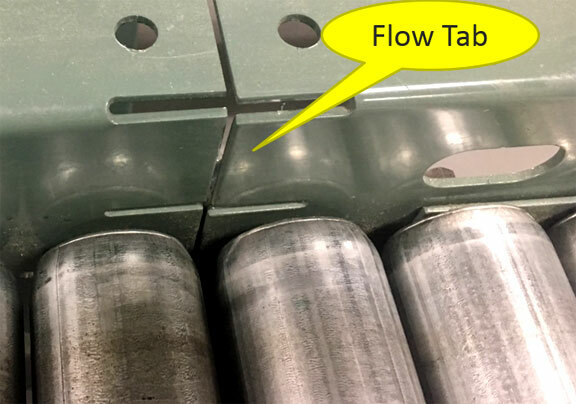 As shown in the picture above, “flow tabs” when sections meet make it possible to match. These tabs can easily be indented with a mallet to prevent snags as cartons move down the conveyor line. This function may require tools for some conveyors, but is easy with many of our Hytrol models. There are many ways to reduce conveyor costs (both initial and long term) by using the right conveyor in the right configuration, for the right application. For more assistance, contact us for fast advice.